This book is so good, I'm afraid it has reduced me to incoherent babbling. I'll do my best to bring order to my thoughts, though, because I want EVERYONE to read it and love it as much as I do. I also don't want to say too much about it because I think it's one of those where the less you know going in the better. Wang is a cab driver in Beijing. He has a wife and a daughter. A strained relationship with his father and stepmother. Overall, he lives a simple, quiet life. When he receives a strange letter claiming he is a reincarnate and has lived many lives before this one, he at first assumes it's someone's idea of a joke. The letter writer identifies him- or herself as his soul mate, saying they have lived linked lives for over a thousand years. 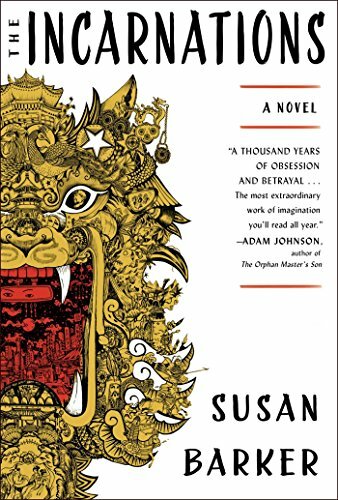 Future letters detail each of those lives in turn, and they are lives full of violence, desire, and betrayal, set against the backdrop of a millennium of riveting Chinese history. The letters' increasing urgency and the sender's intimate knowledge of secret details of Wang's life send him into a downward spiral of paranoia. The momentum is unstoppable because it is fed by two sources: the fascinating stories of Wang's past lives, and the obscured identity of the letter writer. I'd seen The Incarnations compared to the work of David Mitchell, and while I loved The Bone Clocks, it was an intellectually demanding read for me, and I initially wasn't sure I was in the mood for such a challenge. However, I found that despite its rigorous structure, Barker's novel is incredibly accessible. It felt very much like a page-turner even though the prose required my focus. So don't be put off or intimidated by scholarly-sounding blurbs—this book is the perfect balance of intelligence and charisma. It's like Matt Damon, but in book form. I have no doubt this book is destined to be one of my favorites of the year.